dressing room for warm summer days. porch furniture with room enough for even the largest of families. Seperate Study room/2nd Living room and Washer/Dryer room. My name is Chris and I have owned this property for 20 + years. I live in New York City and I am at the house on weekends. House is perfect for large families whom want to be together but also have their 'own space'. 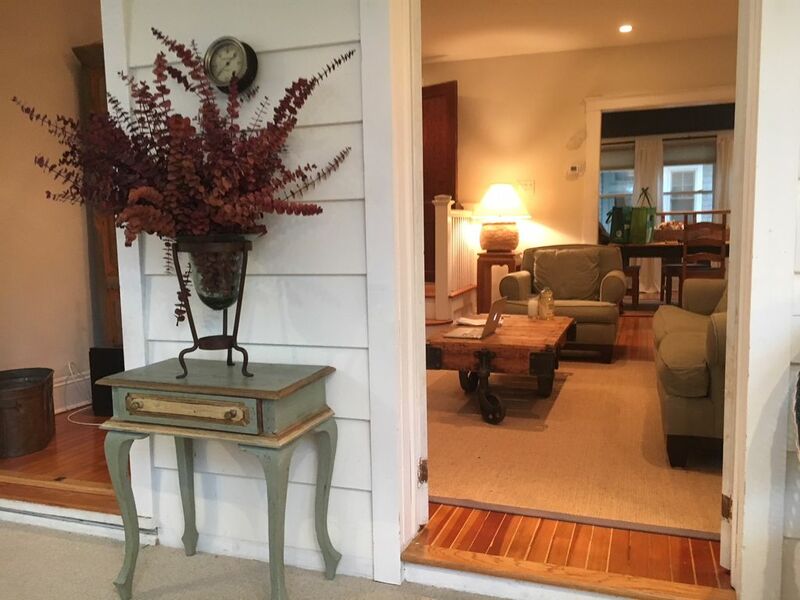 There are literally three living rooms in the house to congregate in as well as an oversized deck and dining room but there is also a two season / indoor porch to escape read a book and be alone in. yes - bath and beach. eat in full stocked kitchen with all appliances (coffee maker, microwave etc) and plates/utensils available. Kitchen is turn key for any size family or dining needs. Short walk to Ocean(4 blocks) and center of town as well as Scenic Lake(2.5 blocks) with Wooden Footbridges and Tennis courts. Close to Golf Course.2 Blocks from train station. We loved the house and the owner was super accommodating to all of our needs. I would recommend to anyone looking to spend time in Spring Lake (which is by far the nicest town at the NJ shore). Will definitely go back again. Wonderful home for the week!!!! Amenities exactly as described in the ad and then some. Tastefully furnished and immaculately kept. The multiple living areas came in handy for our large family. The huge deck in the back was awesome for congregating. The house is deceptively big and the pictures do not do it justice. New appliances made it feel like a home and not a rental. Would recommend to any large family looking to rent in Spring Lake. in downtown sprinng lake is a short 3-5 minute walk.